"The history of policymaking has been dominated by two rival assumptions about markets. Those who have advocated Keynesian-type policies have generally based their arguments on the claim that markets are imperfectly competitive. On the other hand laissez faire advocates have argued the opposite by claiming that in fact free market policies will eliminate "market imperfections" and reinvigorate perfect competition. 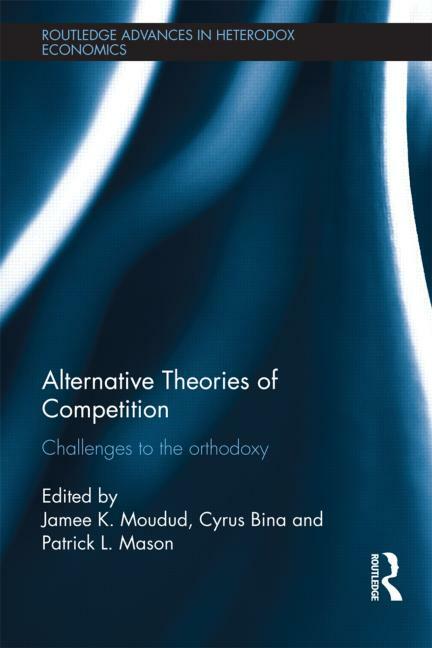 By drawing on the insights of the classical political economists, Schumpeter, Hayek, the Oxford Economists' Research Group (OERG) and others, the authors in this book challenge this perfect versus imperfect competition dichotomy in both theoretical and empirical terms. There are important differences between the theoretical perspectives of several authors in the broad alternative theoretical tradition defined by this book; nevertheless, a unifying theme throughout this volume is that competition is conceptualized as a dynamic disequilibrium process rather than the static equilibrium state of conventional theory. For many of the authors the growth of the firm is consistent with a heightened degree of competitiveness, as the classical economists and Schumpeter emphasized, and not a lowered one as in the conventional 'monopoly capital' and imperfect competition perspectives." Contributions by Rania Antonopoulos, Serdal Bahc¸e, Cyrus Bina, Scott Carter, Benan Eres, Jason Hecht, Jack High, William Lazonick, Andrés Lazzarini, Fred S. Lee, J. Stanley Metcalfe, Jamee Moudud, John Sarich, Anwar Shaikh, Persefoni Tsaliki, Lefteris Tsoulfidis, and John Weeks. Do you have your own views on this matter? For reasons, I suppose obvious, I am very interested on this. I do. Will post something at some point. I am at a conference in Brazil right now. Thanks!